Hospitals in London have been alerted following the death of two men after they apparently took "rogue" ecstasy. The Health Protection Agency (HPA) said NHS London staff were alerted over the deaths of the men who attended events at Alexandra Palace over the weekend. The victims, aged 20 and 21, were admitted to Whittington Hospital on Sunday and died within hours. A 20-year-old is still in intensive care. Police asked others who took the drugs to go to hospital if they feel unwell. The Metropolitan Police said it was yet to establish the cause of the deaths and illness but confirmed it was investigating whether the men may have taken illegal substances, possibly MDMA, the chemical name for ecstasy. Det Insp Colette Smyth said: "We are investigating the circumstances around these two deaths and we need the public's help. "If you have taken drugs during the weekend's events at Alexandra Palace, and are now feeling unwell, I would strongly urge you to attend your nearest hospital as soon as possible. "At this time we have no further reports of anyone unwell at hospital having taken substances at the venue." A spokeswoman for the Health Protection Agency (HPA) said it worked with NHS London to notify A&Es so that "they are aware of the situation". Hospitals were asked to alert police if any further cases emerged. Whittington Hospital confirmed that all three victims were brought to the hospital, two of whom died within hours of each other. The third victim remains in hospital in a serious but stable condition. 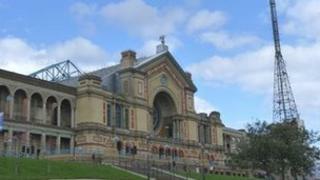 Alexandra Palace in north London hosted two separate all-night events, organised by Lock' N' Load Events, between Friday and the early hours of Sunday. The 20-year-old victim had attended a drum and bass and "dubstep" event on Friday night that continued into Saturday. The second man, 21, who died, and the 20-year-old in hospital, went to a dance event featuring Radio 1 DJ Pete Tong, which began on Saturday and continued into Sunday. A joint statement from Alexandra Palace and Lock' N' Load said they were "deeply shocked", adding that they have "a zero tolerance to drugs".